The new year is a great time to refresh and organize your home. I partnered with Kirkland’s to share three places to use a console table to make organization look effortless. 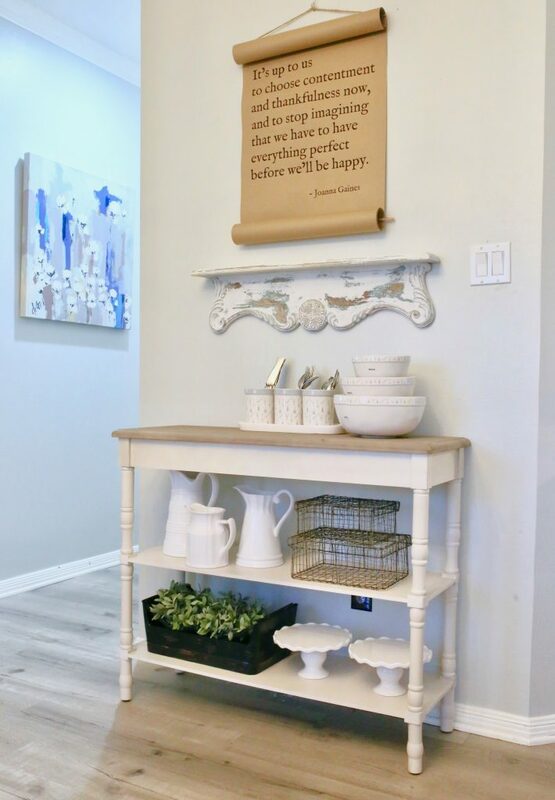 From the clutter that always seems to collect in the entry way to two of the most used rooms in the house, I am using console tables to provide functional yet stylish storage. I hope that you have had a fresh start to the year. If not, it is never too late to get organized. Let’s get started! Y’all, if you haven’t checked out the selection of console tables at Kirkland’s, shop online here. 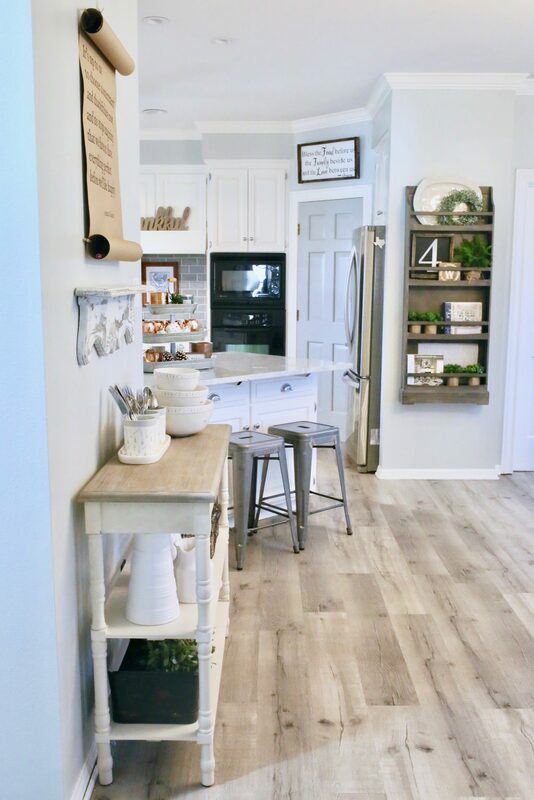 You can find hundreds of beautiful, on trend choices for every room in your house from farmhouse to modern styles. 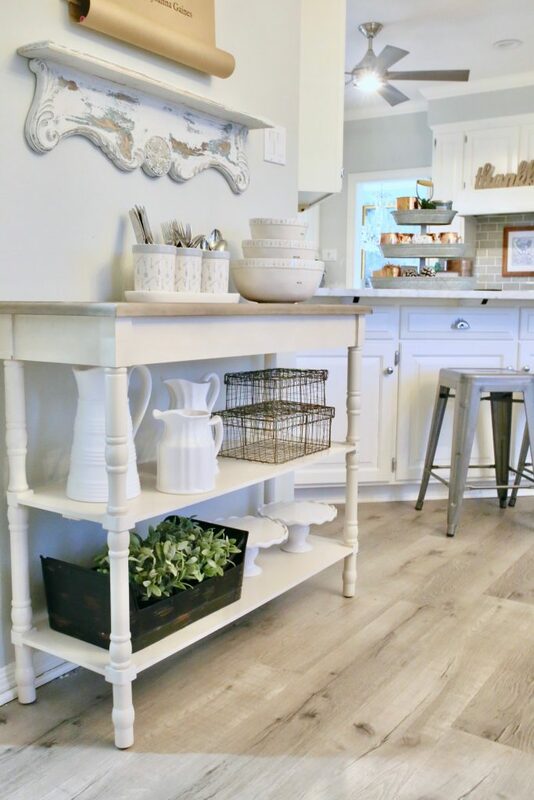 I chose the two shelf cream colored console with a wooden top. I love the the two toned color combination and the look of the antique inspired legs. You can find it here! Plus, it is so versatile and works in almost every room in my house. The hardest part is deciding where it looks best. Tell me in the comments which room you love this table in the most! 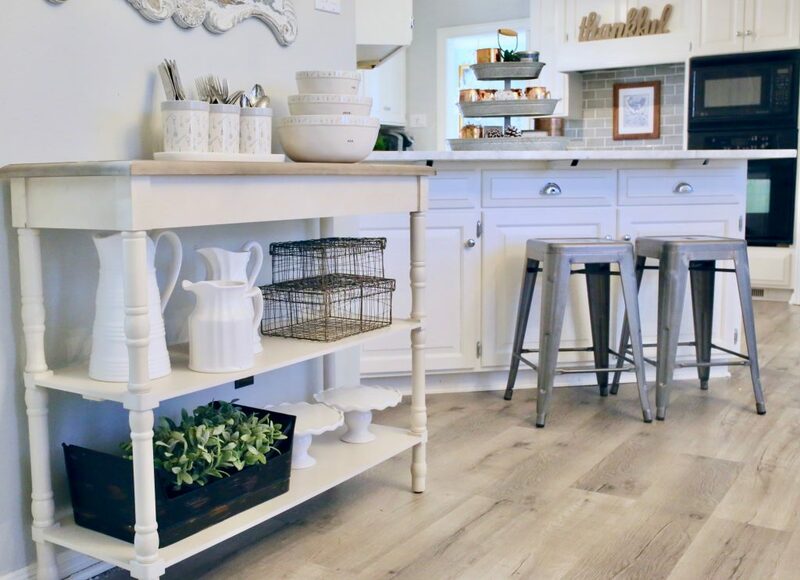 Console tables with multiple shelves are the perfect addition to organize dishes in the kitchen and dining areas. I like to show off some of my favorite collections and add a few decorative finds to open shelving. 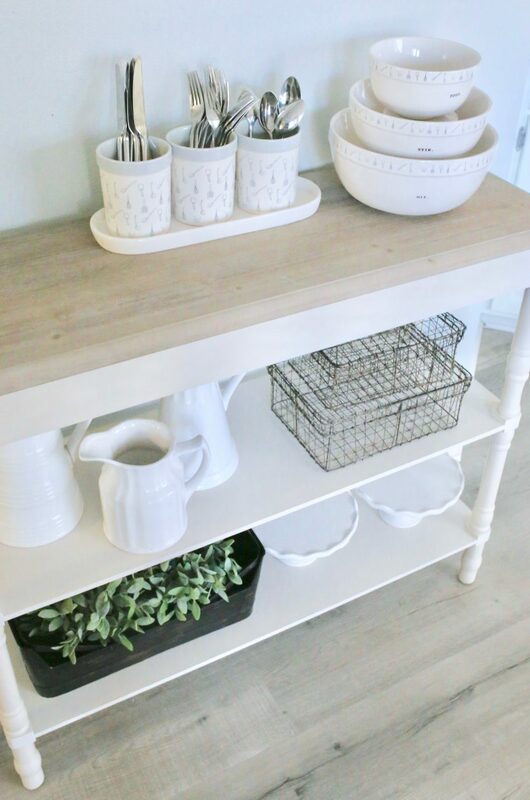 The console table in our breakfast nook right off the kitchen stores pretty dishes. 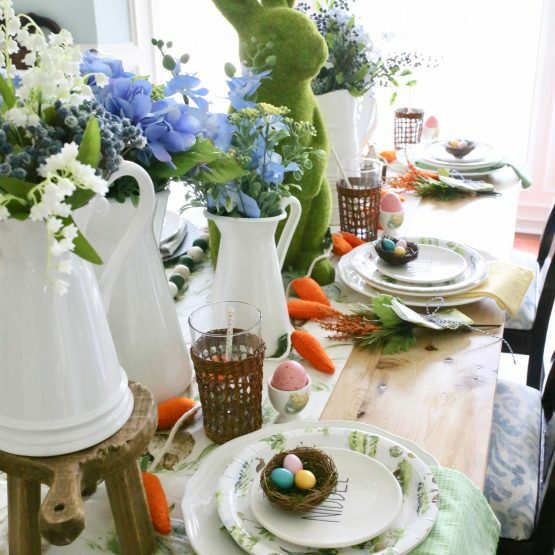 First, place your everyday dishes and silverware on top so that they are easily accessible. 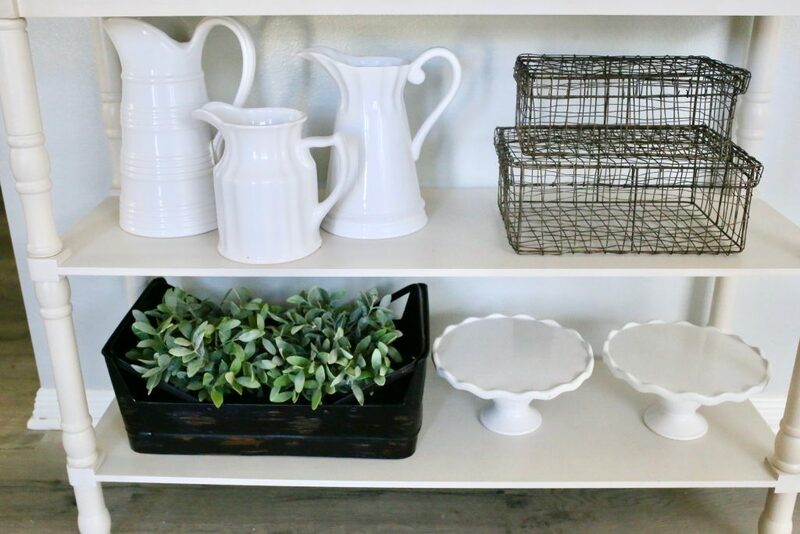 Then, group your collections of serving dishes that are used less often on bottom shelves. 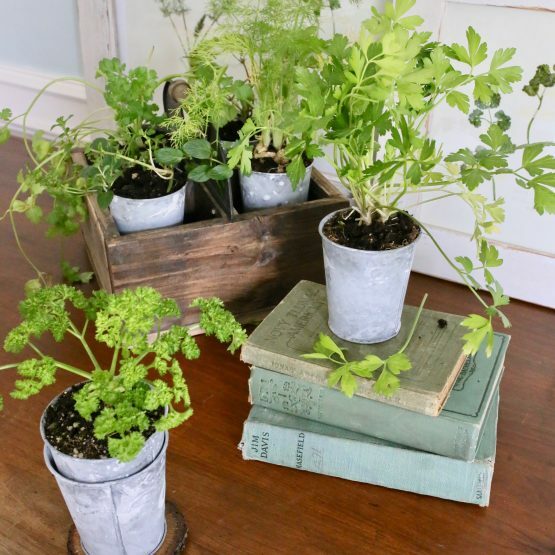 Lastly, add some greenery as a simple way to bring life to a space. 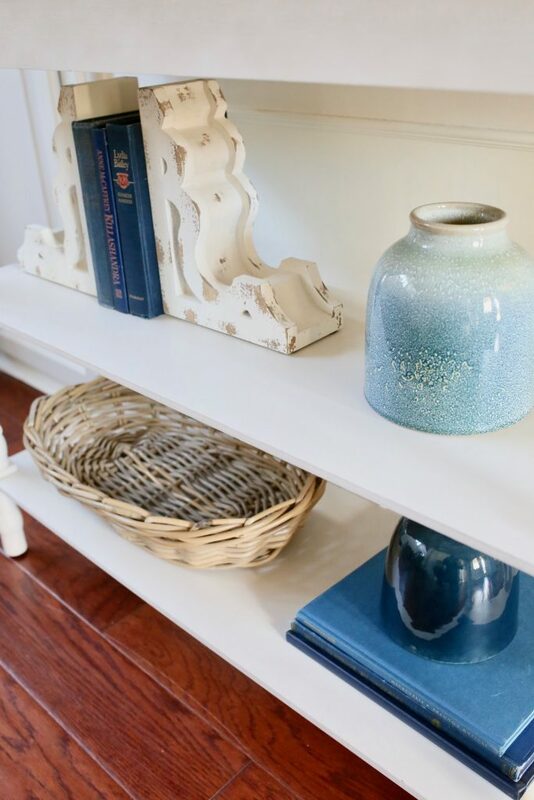 Decor Tip: Create balance when styling shelves by placing similar objects on opposing spaces. 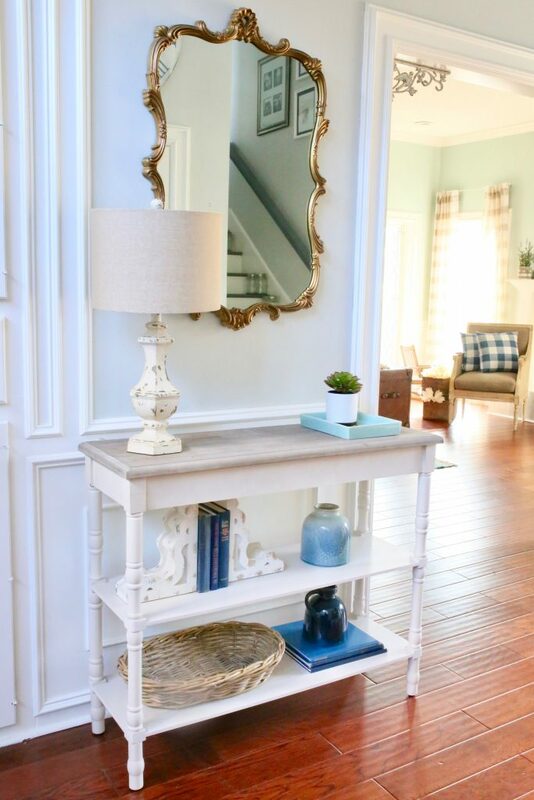 A well styled console table in the entry way is a great way to welcome guests. 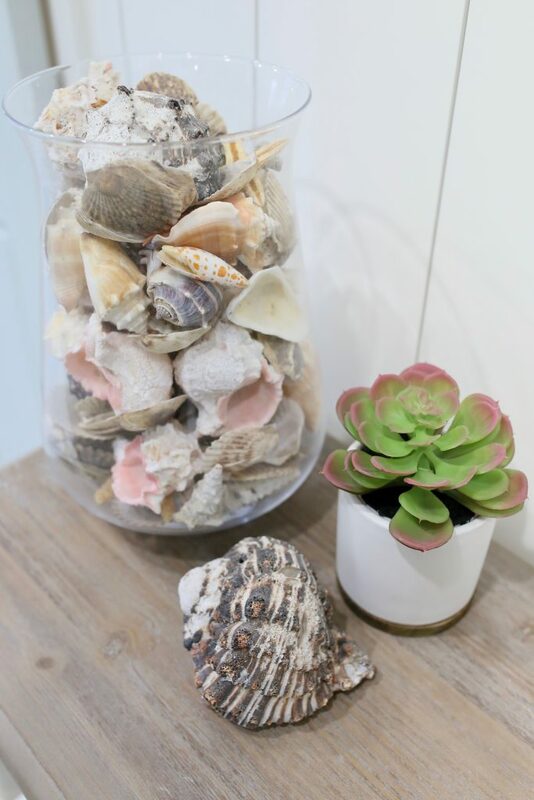 Therefore, decorate your console table with a lamp to provide extra lighting, books and some of your favorite decorative jars . 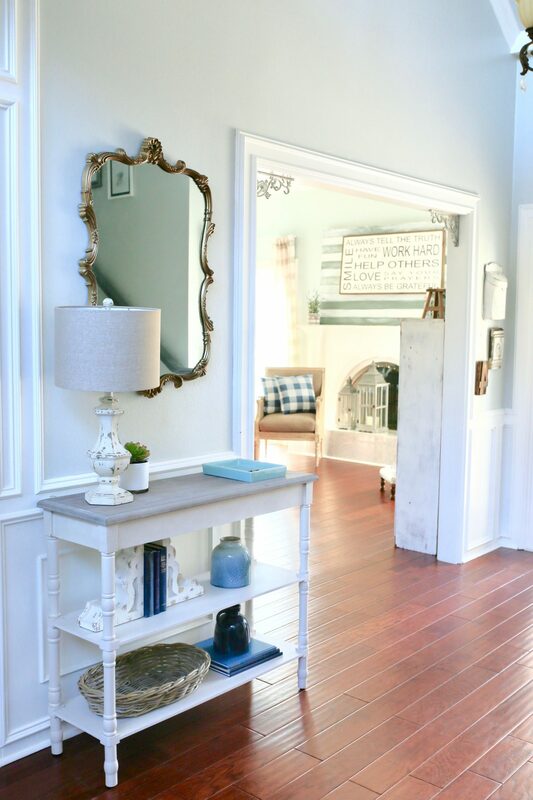 Then, hang a mirror above the console table to brighten up the space and reflect light, especially in small spaces. 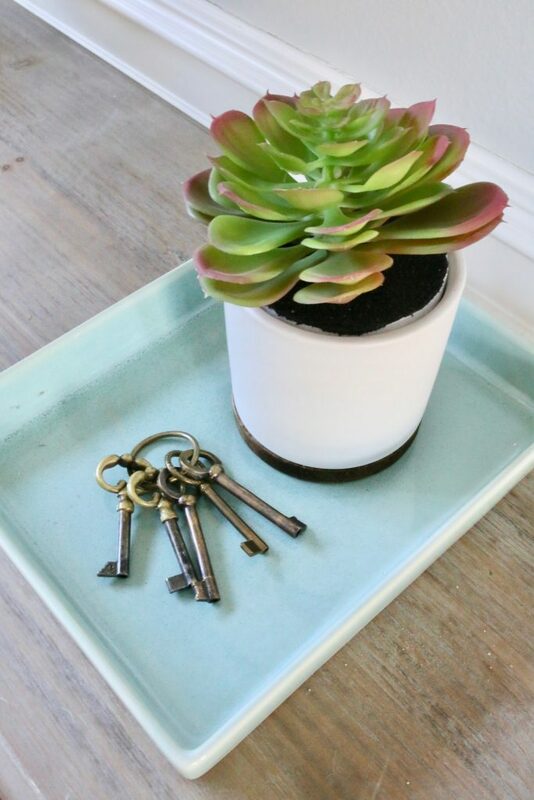 A small tray is the perfect place to gather keys, phones, or mail. Add faux florals to really refresh a room. I love the selection of seasonal greenery, potted plants and stems at Kirkland’s. For instance, this potted succulent is from Kirkland’s. Decor Tip: In any space, always use a variety of textures and materials. For example, think glass, metal, wood, textiles, and natural elements. 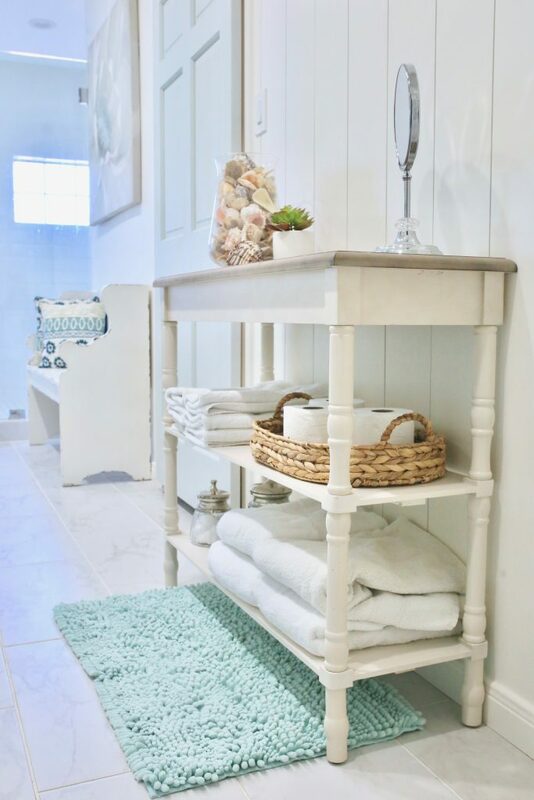 Often, bathrooms are short on storage. 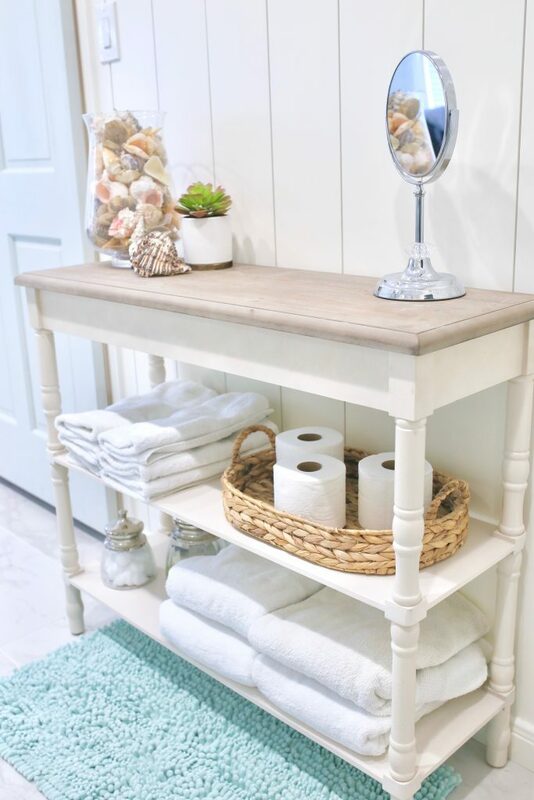 Since console tables are usually narrow, they work great in small spaces like bathrooms. Therefore, using a console table with multiple shelves will give you the extra space you need. Or if you prefer a vanity in your master bathroom, use a console table with just legs to slide a stool underneath. The console table in my master bathroom fulfills my requirement for form and function. 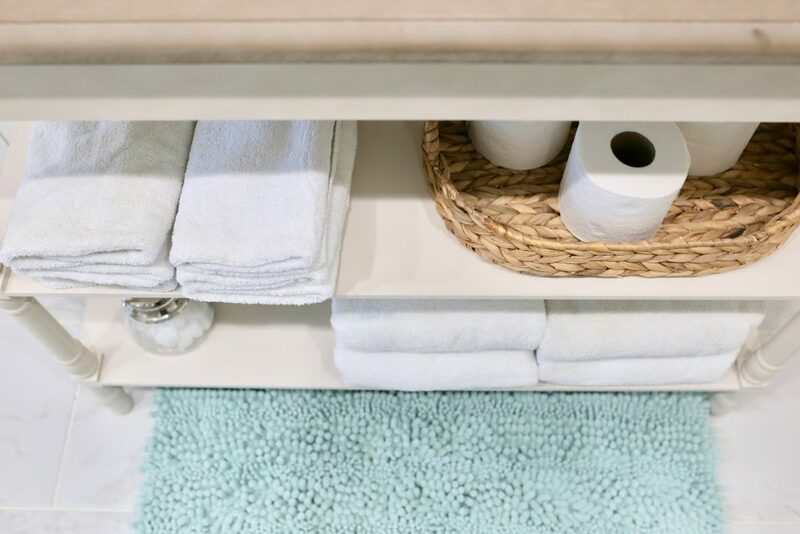 When everything has a dedicated space, keeping things organized becomes an easily attainable daily task. 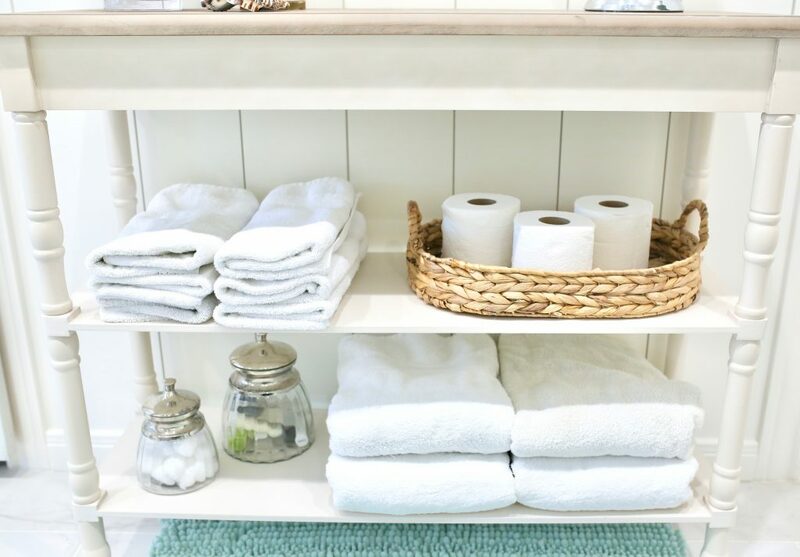 Pretty glass jars, baskets and trays can keep your bathroom essentials together and convenient to find. 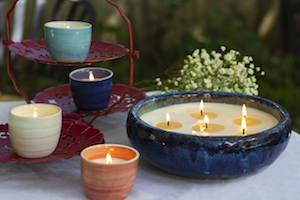 Decor Tip: Create a vignette by grouping items in sets of three. 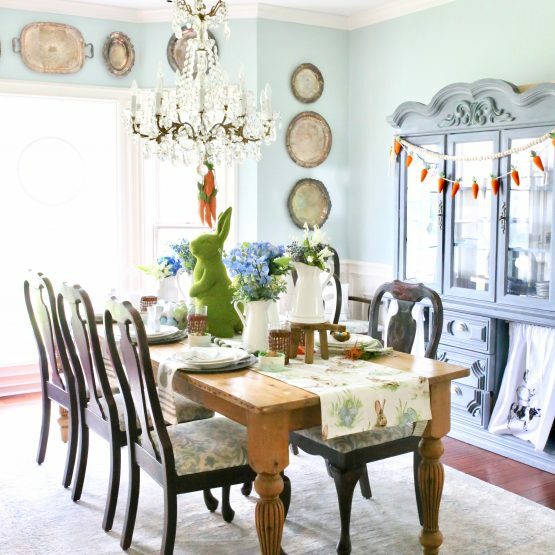 Use a variety of decor finds. For example, something tall, something green and something interesting. 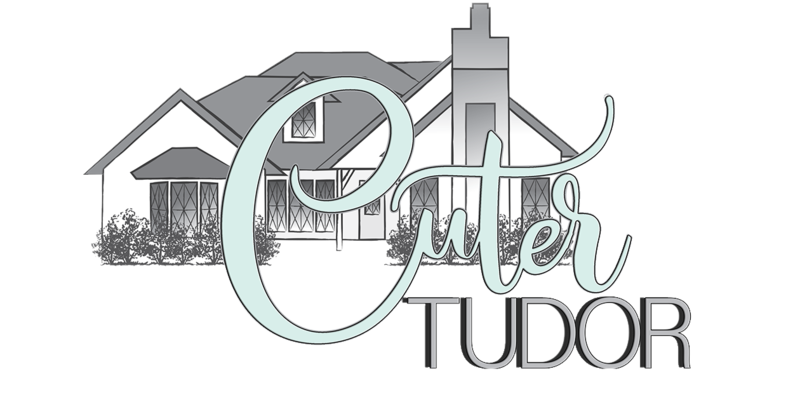 Most importantly, thank you for stopping by the Cuter Tudor, y’all. I know that I always find something new at Kirkland’s, so I hope you do too! Therefore, I encourage you to head to your nearest Kirkland’s store or shop online for a great selection of furniture and home decor. Meanwhile, share this post or save it to your Pinterest design board! 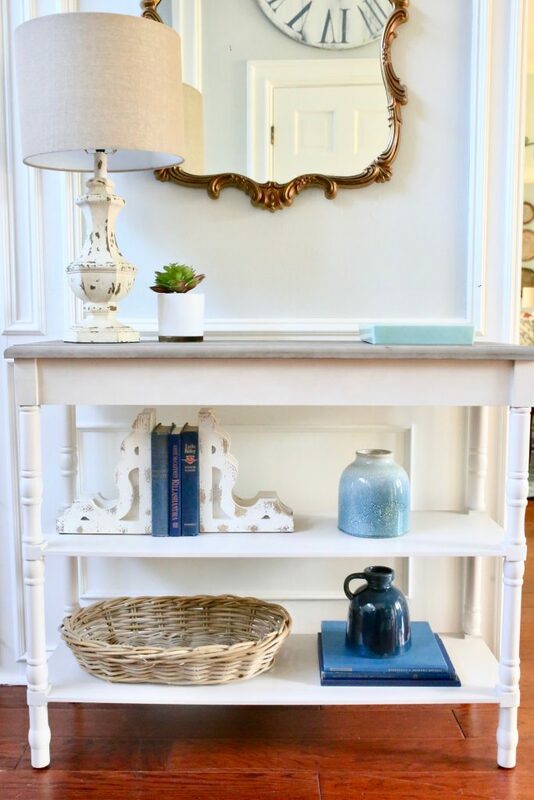 I thought that the console table from Kirkland’s look fantastic and each spot! It would be really hard to choose where to put it because it looks so amazing everywhere! 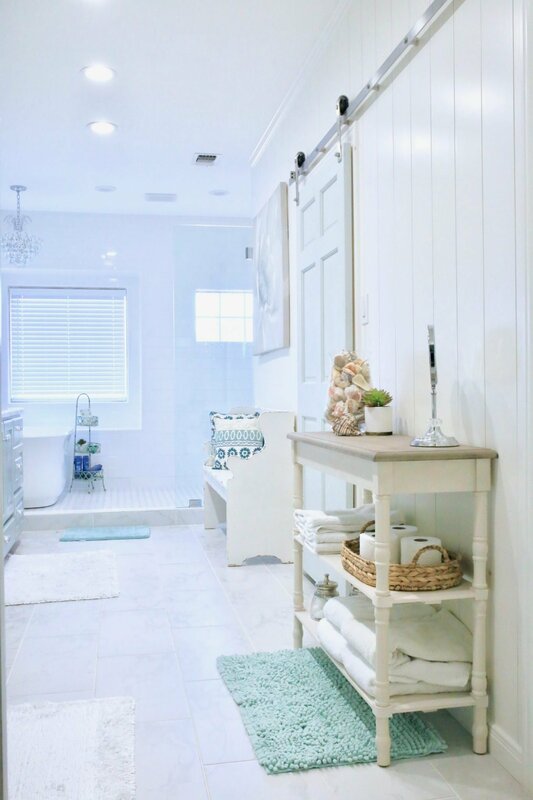 I wish I could tell you which one I liked It best in, I was thinking first the bathroom, then I will thinking about the entryway and then of course how cute it looked near your kitchen! 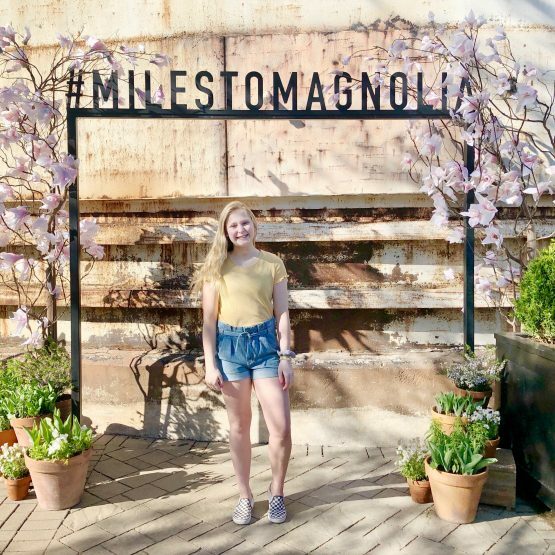 I’m not much help am I lol well whichever place you choose for it to go I have to say that you styled everything so beautifully, and your tips were all so wonderful!